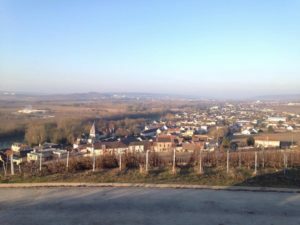 A few weeks ago, my colleague and I decided to go on a road trip… to Champagne! We spent five days there, and we had a fabulous time… saying hi to everyone, and of course making sure that the Champagne is still drinkable (!). We drove from the UK through the Eurotunnel and couldn’t believe how easy and quick it was. Upon arrival in Reims, we checked into our room at the lovely 4* Hotel de la Paix, perfectly located in the city centre. We fell in love with the hotel, its comfortable rooms, friendly staff and welcoming Champagne bar. To end the day in style, we had a delicious dinner in Reims’ oldest Brasserie. The place was absolutely charming, the food was fresh and tasty and the staff were very friendly. We certainly went to bed with a full belly and a happy heart! 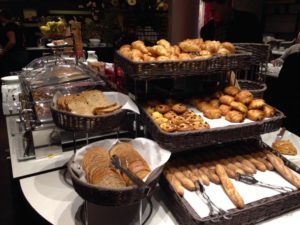 We were dragged out of bed by the thought of croissants and chocolatines for breakfast, and all I can say is we were not disappointed! What a treat to have a proper French breakfast with coffee, fresh bread, mini pastries, homemade cakes, tasty compote and little jars of local jam and honey. After breakfast, we were ready to go on a tour and try some Champagne. Our guide stopped en route to show us a breath-taking viewpoint from where you can see the surrounding vineyards and villages as well as the river. It was incredibly cold with temperatures between -5 and 0°C, but the landscape was just stunning. The frost on the vines looked like snow and it was literally glittering under the beautiful sun. 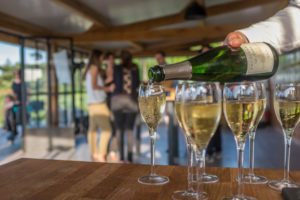 We went to visit two Champagne Houses, a large and a small; both experiences were absolutely amazing and we were well taken care of. It really gave us a good understanding of the differences between a small family-run estate and a large well-known Champagne House, not only in terms of size (one of them owns half of the village, the other has its cellars right below the house of the owners) but also in terms of management, structure and experience. Back at the hotel at the end of the day, we decided to brave the cold to explore Reims. 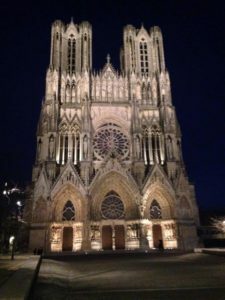 Reims, city where the kings of France were crowned, is a charming place. The Cathedral, a UNESCO World Heritage site is a must see. The Archiepiscopal Palace dating back from the 15th Century is also worth a look. Reims offers a lot of nice shops, cafes and restaurants, and I really liked the fact that it has all the facilities of a big city, yet still feels like a welcoming and tranquil place where you can easily walk between places. After such an enlightening day, we enjoyed a delicious and savoury Michelin starred dinner. All our courses were prepared with top quality ingredients and perfectly cooked. The chocolate dessert with salted caramel and peanuts was a real treat… I’m still dreaming about it! The next morning, we were welcomed as the guests of Champagne Taittinger. After spending about fifteen minutes astounded by their classy Champagne wall (my colleague literally tried to convince her husband that they needed the exact same wall at home! 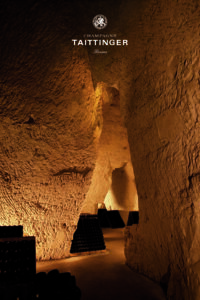 ), we were shown an entertaining introductory video and were taken on an instructive tour of the charming cellars. Their cellars are so big it’s unbelievable, you could easily get lost in there (which isn’t necessarily a bad thing… I’d imagine some people have tried already! ), and the tour ended with a tasting session of their lovely Champagne. After such an interesting morning, we were quite hungry so we made our way to the Chateau les Crayères where we had a delicious lunch at Le Jardin Brasserie. I had some tasty lentils (it’s a local specialty) with a poached egg, it was absolutely delicious. The Brasserie is a cosy and welcoming place in a unique setting combining modern furniture and traditional materials such as wood, brick and steel. 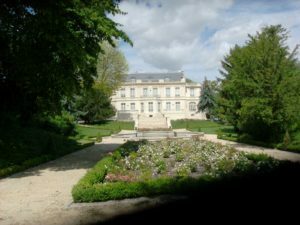 That night we stayed at the gorgeous Château de Rilly and we fully enjoyed the life of princesses. The Château is decorated in a traditional French style, and our room was spacious with a beautiful marble bathroom with both shower and bath. From our room we enjoyed a breath-taking view across the Château’s park and surrounding vineyards. In the evening, we had a very nice dinner in the Château’s gastronomic restaurant. To end our trip in style we visited two other great wineries during the day. We could not believe how welcoming and eager to share their knowledge and passion these people were. We had such a good time at these estates, we couldn’t wait to recommend them to everyone. For our last evening in Champagne, we had a lovely tasting session in a local Champagne bar right in the centre of Epernay. We decided to make a toast to Champagne and to our next trip to this splendid region!